Photo-electric sensor, diffuse XUK5APANM12 PNP 1NO 12-24VDC 50x50x18mm, 0.3...1 m Photo-electric sensor with plastic housing 50x50x18 mm, diffusion type, PNP transition, with one normally open contact, working distance 0.3-1m. Electrical connection - male connector M12, 4 pins, type of output signal - solid state. List Price 135.00лв. VAT Incl. 128.25лв. VAT Incl. Optoelectronic Switch barrier type with fiber-optic ODFB54N311L NPN NO + NC 78x22x20mm 10-30VDC range 100mm aluminum Optoelectronic Switch barrier type with fiber-optic ODFB54N311L NPN NO + NC 78x22x20mm 10-30VDC range 100mm aluminum. Optoelectronic Switch barrier type with fiber-optic ODFB54P311L PNP NO + NC 78x22x20mm 10-30VDC range 100mm aluminum Optoelectronic Switch barrier type with fiber-optic ODFB54P311L PNP NO + NC 78x22x20mm 10-30VDC range 100mm aluminum. 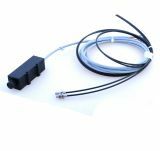 Optoelectronic Switch ODD12N111L PNP NO M12x67mm diffuse 10-30VDC range 200mm Optoelectronic Switch ODD12N111L PNP NO M12x67mm diffuse 10-30VDC range 200mm. Optoelectronic Switch ODD18N311L NPN NO + NC M18x78mm diffuse 10-30VDC range 300mm Brass Optoelectronic Switch ODD18N311L NPN NO + NC M18x78mm diffuse 10-30VDC range 300mm Brass. List Price 125.00лв. VAT Incl. 118.75лв. VAT Incl. Optoelectronic Switch ODM18N111L NPN NO + NC M18x78mm color marker green 10-30VDC range 20mm brass Optoelectronic Switch ODM18N111L NPN NO + NC M18x78mm color marker green 10-30VDC range 20mm brass. Optoelectronic Switch ODM18P311L2 PNP NO + NC M18x78mm color marker green-red 10-30VDC 20mm brass Optoelectronic Switch ODM18P111L PNP NO + NC M18x78mm color marker green-red 10-30VDC 20mm brass. Optical sensor ODS18N101 NPN NO M18x60mm Barrier with slit 3mm 10-30VDC brass Optical sensor ODS18N101 NPN NO M18x60mm Barrier with slit 3mm 10-30VDC brass. Optoelectronic Switch ODD18P311L M18x78mm PNP NO + NC diffuse 10-30VDC range 300mm Brass Optoelectronic Switch ODD18P311L M18x78mm PNP NO + NC diffuse 10-30VDC range 300mm Brass. List Price 139.00лв. VAT Incl. 132.05лв. VAT Incl.